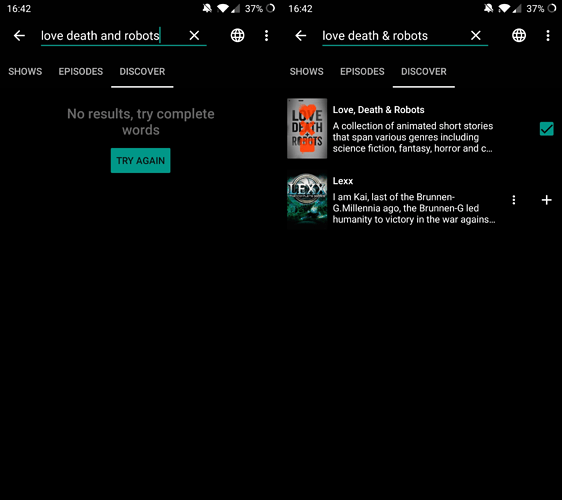 Was using the search function to add a show today, but couldn’t find it until I changed “and” to “&”. I believe it to be just a small tweak to make the experience just a little bit smoother. I hope the development team can get this sorted out! I love using SeriesGuide and I look forward to watching it continue to grow! Thanks. Search is powered by trakt.tv (English) and thetvdb.com (all other languages), so this will not change for the time being, sorry.